Did you know that More than 45% of all adults snore on occasion and 25 % snore all the time! We spend much of our lives sleeping but how much do we now about the process? Definition of sleep: Sleep is a natural and periodic state of rest during which consciousness of the world is suspended. Process of Sleep - Sleeping is attended by a relaxation of the muscles, and the absence of voluntary activity for any rational objects or purpose. The pulse is slower, the respiratory movements fewer in number but more profound, and there is less blood in the cerebral vessels. It is susceptible of greater or less intensity or completeness in its control of the powers. Synonyms for Sleep are slumber; repose; rest; nap; doze and drowse. 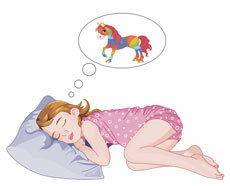 Browse our list of trivia and facts about sleep and dreams - fascinating! Trivia Fact 3: People can take cat naps with their eyes open without even being aware of it. Trivia Fact 8: Dreaming that you are taking a nap, suggests that you need to take a little time off to relax and take it easy. 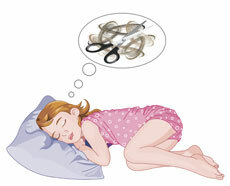 Trivia Fact 19: The body language of sleep positions reflect your personality traits! 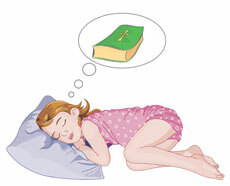 Trivia Fact 20: Dreaming that you are sleeping indicates peace of mind. Trivia Fact 21: REM sleep may help developing brains to mature. Trivia Fact 32: Jet Lag is the inability to sleep caused when travelling across several time zones causing biological rhythms to get "out of sync." Trivia Fact 36: The record for the longest period without sleep is 18 days, 21 hours, 40 minutes during a rocking chair marathon. 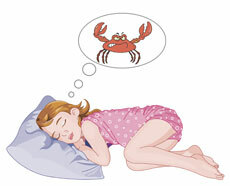 Trivia Fact 44: The most common emotions experienced in dreams are anxiety and fear. Trivia Fact 46: Sleep depravation produces higher levels of corticosterone, a stress hormone and fewer brain cells are produced. Trivia Fact 50: Brains are more active sleeping than watching TV!